After his celebrated debut at the Salzburg Festival 2004, the Austrian newspaper Salzburger Nachrichten ran the headline: “A softly tongued articulation, the greatest agility, an extremely self-confident embouchure, a coloratura style, a soloist of this quality refines every piece of music. “Born in Szeged, Hungary, in 1976 and grown up in Kiskörös Gábor Boldoczki‘s brilliant playing makes him the most exceptional trumpeter of his generation. 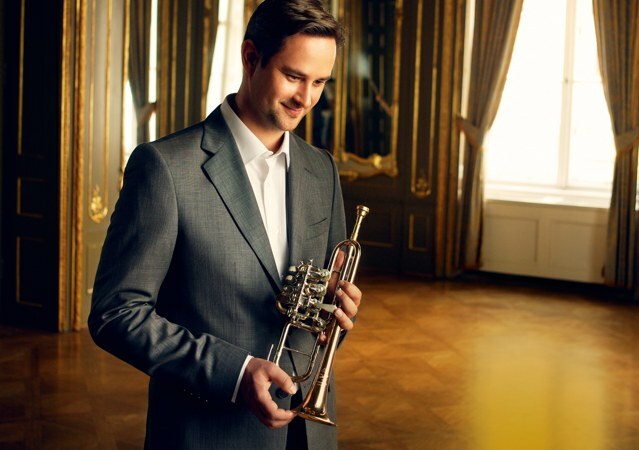 Thus, it is not surprising that the renowned German newspaper Süddeutsche Zeitung named Gábor Boldoczki “the worthy successor” to the all time trumpet king Maurice André. The international press also feted him as a magnificent trumpet virtuoso. At the age of 14 this young exceptional trumpeter won the first prize at the National Trumpet Competition in Zalaegerszeg, Hungary. Following his studies at the Leo Weiner Conservatory, the young musician continued at the Franz Liszt Conservatory in Budapest and as a master class student under Professor Reinhold Friedrich before starting his international solo career. By winning the internationally renowned music competition of the ARD in Munich, Boldoczki celebrated his final breakthrough at the young age of 21. Then he received the Grand Prix de la Ville de Paris at the most distinguished trumpet competition of all – the Third International Maurice André Competition in Paris. In August 1999, Gábor Boldoczki received the coveted Prix Davidoff of the Reemtsma-Foundation for his “technical perfection and fully-developed artistic virtuosity”, followed by the highly esteemed Prix Young Artist of the Year in 2002. After previously being awarded the Echo Klassik as Best Newcomer in October 2003, Gábor Boldoczki was again honoured by the German Phono Academy in 2008 as Instrumentalist of the Year.During his European tour he performs with well known orchestras (e.g. Bavarian Radio Symphony Orchestra, Deutsche Kammerphilharmonie Bremen, Beijing Symphony Orchestra, Sinfonia Varsovia, Berlin Symphony Orchestra, Gulbenkian Symphony Orchestra, Festival Orchestra Budapest, Hungarian National Philharmonic Orchestra, Lucerne Symphony Orchestra, Strasbourg Philharmonic Orchestra, Cannes Symphony Orchestra, Prague Symphony Orchestra, Czech Philharmonic Orchestra) as well as chamber orchestras (e.g. Franz Liszt Chamber Orchestra, Camerata Salzburg, Zurich Chamber Orchestra, Munich Bach Collegium, Salzburg Mozarteum Orchestra, Munich Chamber Orchestra, Prague Chamber Orchestra, Haydn Philharmonie, Lithuanian Chamber Orchestra, Moscow Soloists, Vilnius Festival Orchestra, Dresdner Kapellsolisten, Bach Orchestra of the Gewandhaus Leipzig, Wuerttemberg Chamber Orchestra Heilbronn) and, furthermore, he gives gala concerts with Edita Gruberova.Gábor Boldoczki was the first trumpet soloist worldwide to be invited to perform the trumpet concerts of Michael Haydn at the Salzburg festival. Furthermore, he regularly follows concert invitations to South America and China.For considerable time he has been in demand as interpreter for premiering contemporary music. Gábor Boldoczki accompanied for example Gidon Kremer and the Kremerata Baltica for the world premiere performance of Georg Peleci‘s “Revelation” at the music festival Les muséiques in Basel. At the international Dubrovnik Summer Festival he premiered the Trumpet Concerto by Boris Papandopulo. The trade magazine Fono Forum reviewed the CD-recording for SonyBMG with the Zurich Chamber Orchestra as follows: “Boldoczki performs the concertos more elegantly, more smoothly, and more naturally than any of his competitors . soft, long phrases characterize his Haydn interpretations. The variable tone is one of the many details that make Boldoczki‘s recording so worth listening to.” Sony BMG released further recordings together with the Franz Liszt Chamber Orchestra, the chamber orchestra “I musici di Roma” and the Sinfonia Varsovia.Starting at the Musikverein Vienna in November/December 2008, Gábor Boldoczki will tour in Europe together with the Sinfonia Varsovia. At the same time SonyBMG will release a new CD. It includes sonatas for trumpet and organ as well as sonatas for trumpet, cello and cembalo. He will be accompanied by Hedwig Bilgram and László Fenyö.Boldoczki‘s “extremely fine and characterful” Shostakovich recording for piano, trumpet and orchestra partnered by the Gulbenkian Orchestra led by Lawrence Foster and the pianist Lise de la Salle was selected by the Grammophone Magazine as “Disc of the Month” in April 2008. Awarded the Soloist Prize, Gábor Boldoczki will follow an invitation as Artist in Residence at the Festspiele Mecklenburg-Vorpommern 2010.His versatile repertoire ranges from Bach to Penderecki, from Vivaldi to Shostakovich to Hindemith, Takemitsu, Ligeti and Arvo Pärt. Gábor Boldoczki performs on B&S instruments.